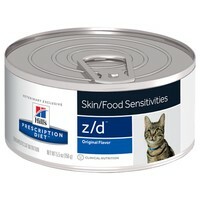 Hills Prescription Diet ZD Food Sensitivities Wet Food for Adult Cats is a nutritionally balanced diet to support cats in the management of food allergies and/or intolerance. Sensitive or irritated skin, coat and ear conditions, or severe digestive issues are some of the more serious conditions that can come from food sensitivity. Clinically proven, Hills Z/D can be used regularly to help alleviate these adverse reactions and is also packed full of essential nutrients and fatty acids to support your cat’s general health.